Verb for Keeping Warm Yakkity Yak, "indigo blue sky" and "cafe au lait"
I *really* love this set though. The pattern reminds me of something vintage, and the color pairing of the blue and tan-gold do as well. (go bears!) I can't take credit for the colors working together though-- I went into Article Pract and these skeins were just sitting there next to each other like they belonged together :) I think AP is the only place you can get the Yakkity Yak now-- they had some and even in these colors last time I was there. SUCH a hammy pie. I like the gold detail at the cast on edge-- I did use some waste yarn to make a forehead-length lining, but removed it since the yak really is soft enough to wear (and I hate extra finishing :)) I just used some extra gold to do a crochet chain around the picked-out waste yarn edge to secure it. I didn't know I needed the shorter version til I was halfway done (swatch? for a hat?! ;)) so I just shifted the chart and its top decreases over halfway for the same result. Easy really. No mods with the mittens, except I used a 2-color caston for that same gold detail at the cuff, purled one row in MC, then started the pattern. Verb for Keeping Warm Creating Superwash Sock, "Wonder Boy"
I fell in love the minute I saw this on Kristi's blog. Look closely-- it's a 2" spiral that winds its way around the hand and arm! I am a SUCKER for innovation, and this! is! OSSUM! Knitting these I kept thinking that I want a spiral knit sweater now :) I'm not a cool enough knitter to figure that one out, but seriously I'd make one. I lengthened mine (Kristi's version is a more traditional armwarmer length), and chose a shorter dye repeat with "Wonder Boy" (original knit in Wisdom Yarns Poems sock, a long striping yarn like Noro). I chose to lengthen them because lately I've been wearing my handknit kneehighs under my jeans in the mornings I drop my son off to school-- quite warm and almost like secret garters under denim in highschool. I think these will serve under a jacket with a light shirt quite nicely with our cold mornings and warm afternoons. I retained the original caston #s for my size and only used a change in needle size to add width and extra spirals for length-- a US 3 for the above and upper forearm, a US 2 for the middle arm and US 1.5 for wrist and hand. I think if you wanted, you could also decrease stitches while spiraling if you wanted to use the same needles throughout-- the nice thing about sock yarn though is that it is forgiving knit on a range of (small) needles when you're not worrying about abrasion and feet and shoes. 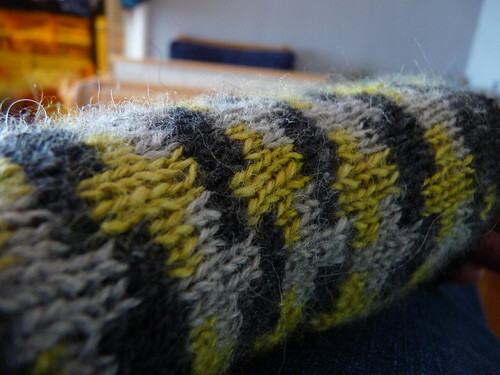 I want to knit another pair of Gasteropoda from a long-repeat handspun... 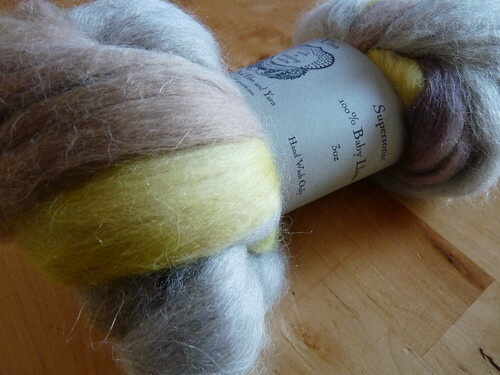 I can't help but think how AWESOME they'll be spun/knit from a DyakCraft (formerly Grafton) batt. And what a great choice for small leftover bits of sock yarn?! But I do like these a lot... it's like a maybe-poisonous snake squeezing me. Aside from the spiraling construction (which is effortless-- no finishing), what really got me was the gusseted afterthought thumb. I'm not familiar enough with mitten construction to know if this is new or not, but it's really cool. 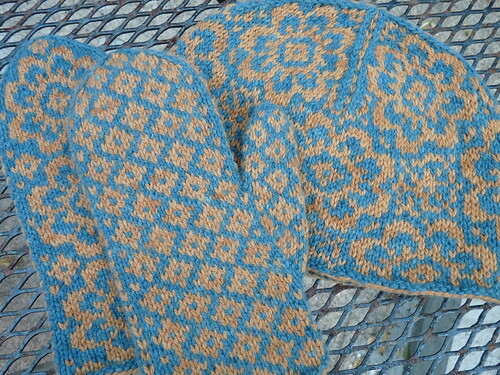 I want to figure out how to use it for traditional afterthought mittens now! For my last mitt project, I knew I wanted to use handspun-- specifically the baby llama from the Verb Ultra fiber club shipped in August. There were three distinct colors so I sketched up a stranded design using 3 colors (2 colors per row), tetris stylings. Phew. If you thought that was a lot of mitten action, be sure to pop over to Verb for Keeping Warm's Ravelry group to see all of the entries and vote-- the threads are all stickied to the top til next week. the afterthought gusseted thumb-- is that the gusseted thumb you do after finishing the whole mitt? if so, i lurve it...the only kind of thumb i do for my mitts. :o) your little one is such a ham! and such a cutie pie! I love ALL of them! The End of May set is delicious. And that picture of the Little Man just killed me. He's SUCH a ham! I haven't been buying yarn, but I may have to buy those patterns. I think you should write up the Tetris mittens yourself. And YAY for new stitch markers in the shop! Mine have all mysteriously gone missing, much like my T-pins. Sigh. 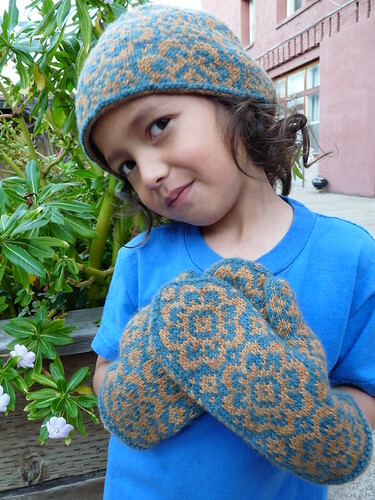 fabulous mitts and hat. I love matchy too. the boy is growing so fast! tetris, no. space invaders, yes. I understand about not being able to get anything done. No kids to work around, there is too much quiet and space. Love the Mittens!! Absolutely beautiful! I loved the construction of Gastropoda so much that I had to buy the pattern, and I'm not one for buying patterns. Thank you for introducing us to it! Wow, such gorgeous knitting! I haven't even started thinking about winter stuff, and we've already had temps below 0C. Oops! Lovely handknits...especially the hat and mitten set. Awesome gloves and mittens!! Love the stitch markers too! I have a set and LOVE them! lovely mitts! I love the llama ones especially. May I ask how you got the pic of your Etsy listings onto your blog? It doesn't look like a screen shot, but I can't figure out how you did it. beautiful post love the hat and gloves! the words yummy and wow keep coming to mind! love, love, love The End of May and the pic of your little guy! I'm going to act as though you're coming back someday, and then, I'm going to quit acting. Those designs are awesome! I thought my Grandma was good but you may be better. You're as good as houston gold! I completely agree! 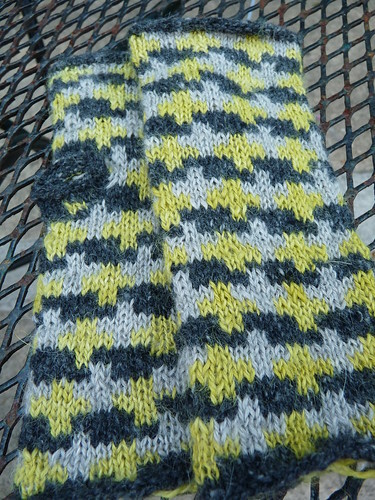 I love the patterned socks and gloves that are all one color but have fun textures and designs built in. It's so subtle, but cute. Any kind of sock/legging can amp up any personal style! Love the blog! i saw myth busters the other day and a dummy was getting knocked out of hand knit sox ... i missed the very very beginning of the show ... were they yours? is myth busters *really* the only way we can talk to each other any more? My client sells medical compression socks and was wondering if we might be able to get listed on your left navigation as a suggested resource over at http://www.jrsmedical.com/SOCKS-STOCKINGS/nav.aspx for "compression socks". Let me know what options exist to create a partnership between this medical supplier and your website. Look forward to hearing back from you. good article in this month's new yorker in "the art world" section called "fearing the worst" by peter schjeldahl ... deals with a show called "bye bye kitty!!!" several references and ideas in there that you'd be interested in. Well, that's a nice work. 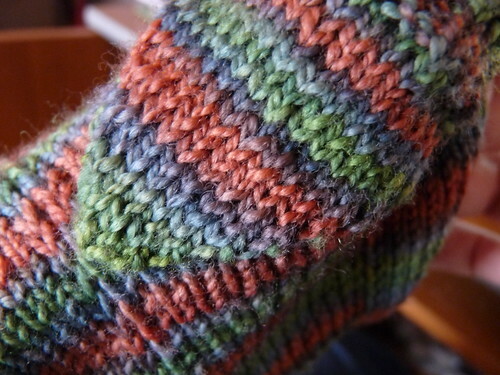 I love the color combination you've used on the hat and the mitten. Indigo blue is a nice color. Just continue doing it. There's no wrong in it. Cheap electronic cigarettes at www.thesmokebot.com. I'm doing my own creation and I am enjoying this. I started on a hat. six words make a LOT of difference ... but i still have no idea what happened and would like to know ... someday. What time is zero o'clock? Hmmm . . . smaller breasted, thicket haired, or sweatier mates. It doesn't testing that theory on poor lab rats to know which one I 'd naturally select. Why'd you post this article? I mean, I thought you more of a Mercedes AMG, quite honestly. Honestly, I have no idea what happened, either; it is one of my most regreted pasts. I would accept fractions and decimals of your presence. first and foremost, we need a channel of communication. i'm guessing "not here" is more appropriate? Agreed to a better channel and to liberal definitions. Someone once told me something to the effect of, "If only there were as many definitions for ________ (fill in the blank) as there are for Inuit words meaning 'snow.'" Multiple connotations and interpretations make the world a more interesting place. I hope your assumption is accurate: I would hate to disappoint any more than I already have. Please request permission to begin. If that won't work (for whatever reason), please let me know. I, too, was once a good friend. I continue to be an optimist and someone who can't help but try. Good luck in your pursuits. She's worth a wild goose chase or two (or three or four...). p.s. Why don't you capitalize 'I'? A sign of humility? We read "Arachne," yesterday in class. I thought of you. Not because of the hubris, and not because you're turning into a spider, but because I imagine you in a flurry of wool competing with the gods, or just competing with your past selves, in some obscure corner of the world / your mind. Very informative article. Pretty sure people would love to go to that place for shopping. Surviving school demands performing assignments when they are assigned. When you procrastinate you will have to hurry to get custom writing service assignments completed, which will guide to you receiving negative grades for these assignments. You must do the perform on time. Thanks for sharing this information and keep updating us. This content is quite informatics to me. Which one: Face punch? Auditory hallucinations? Or Avian Flu? Cyrillic? I miss your handwriting more than anything. Send me a postcard... Even if there is nothing more than my address upon it. I hope you are happy and okay, Aija.